A pontifical is a book of the church services conducted by a bishop, such as the ordination of a priest and the dedication of a church. This pontifical from Anglo-Saxon England was discovered in 1970 in the stables at Brodie Castle, in Forres, Scotland. It is called the 'Anderson Pontifical' after Hugh Anderson, minister of the parish of Drainie, Morayshire, in the early 18th century, whose name is inscribed with date in the book. No one knows how the ancient service book got from its place of origin, probably Canterbury or Winchester, to Scotland, but it is possible that it may have arrived in the Middle Ages, before the 13th century when Drainie was the seat of the bishops of Moray. During services at a cathedral on important feast days, such as Christmas and Easter, the bishop would say a special benedictional prayer. This is the blessing for Easter Sunday, identified by the title in red capital letters in the middle of the page. 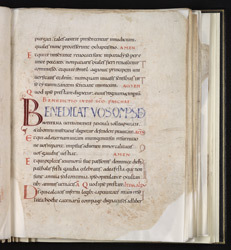 The blessings tend to be formulaic, beginning with conventional openings ('Benedicat vos...', 'Bless us...') and proceeding through a series of prayers focusing on the significance of the feast, each responded to with 'Amen' or other set responses, which are noted in red letters in this manuscript.